Founded in 1932 in Melbourne, Australia by Bill O’Brien and Harry Norville, Breville is a world renown brand the makes small kitchen appliances such as kettles, toasters, irons, blenders, high quality juicers, food processors and many others. They are the brand that created the original sandwich toaster, which is why people call sandwich toasters a “Breville” much like vacuum cleaners are called “Hoovers”. Strangely enough, Breville originally made radios in the early days, then went onto producing mine detectors for the war. In 1982, The Australian side of Breville sold its ownership of the brand in Europe, which is now owned by a company called Jarden. The European side to the business trades out of the UK and much of its business is catered to the UK market. Breville is best known for its quality of build and it’s propensity towards excellence. The juicers they produce are unlike any other in the market, especially the trademarked Juicer Fountain Series. They not only look good, but they are well designed, well constructed and meet the needs of their millions of customers. There aren’t many brands that produce products within varying price brackets and that can still exceed in quality and functionality. Breville does this and then some. Breville Juicers are consistently best sellers on Amazon. They are currently top of the pile when it comes to sales, and that’s not just in the UK! 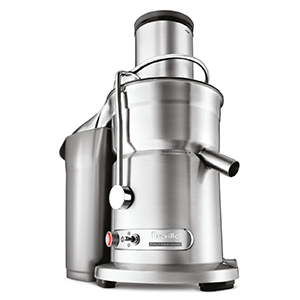 Breville fruit juicers provide people with a great way to stay healthy. Juicers help detoxify and spring clean your body and give you the added bonus of gaining an immense range of vitamins and minerals from the source, rather than through tablet form. 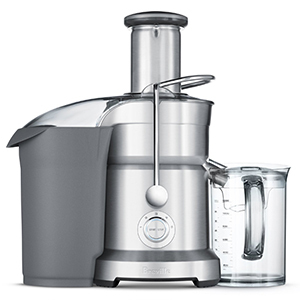 The Breville Juice Fountain series is so good that it owns about 20% of the total juicer market. Stats like that just don’t lie! It is also considered the most technologically advanced system, which is not surprises as Breville is quite a dynamic and forward thinking brand when it comes to technology. If you love the taste of freshly-squeezed juice but don’t have the necessary time to devote to making it yourself, you need the Breville JE98XL Juice Fountain Plus. This Breville juicer can make an 8oz. cup of juice in record time: only five seconds. With the extra-large feeder chute, you don’t even need to waste time peeling, coring or chopping your fruits or vegetables. In the time it takes you to put away your leftover fruits and veggies, you’ll have a cold, refreshing glass of juice ready to consume. The JE98XL even offers quick and easy cleanup, with almost all of its parts being dishwasher safe. The Breville BJE510 Juice Fountain Multi-Speed lives up to its name by providing five different speeds, ranging from 6500 RPM to a blisteringly fast 12500 RPM. Thanks to its adjustable speeds, the BJE510 will be able to juice any fruit or vegetable you throw at it. You can use the lower speeds for soft fruits or leafy vegetables while using the higher speeds for denser fruits and vegetables such as apples and carrots. Like the JE98XL, the BJE510 features an extra-wide feeding chute that is large enough to fit an entire apple. Not only can this Breville juicer fill an entire pitcher but you can also use the included spout attachment to juice directly into a glass. Low on counter space but want to enjoy the delicious taste of homemade juice? 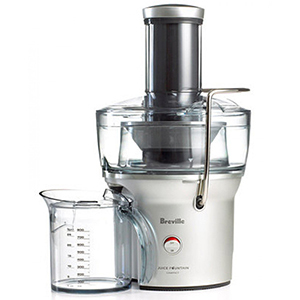 Then you need the Breville BJE200XL Juice Fountain Compact. 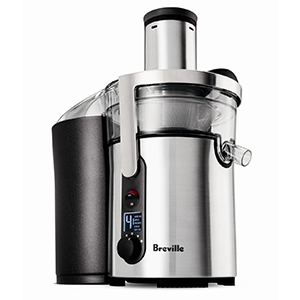 As the name implies, the Breville BJE200XL takes up a fraction of the space that other juicers do, letting you slide it into any available nook or cranny on your counter. The BJE200XL is able to slim itself down to this small size by collecting pulp in the footprint of the unit. Even though this juicer is tiny, it still packs the same powerful punch as Breville juicers twice its size. With its stainless steel cutting disc and micro mesh filter, the BJE200XL delivers more nutrients and vitamins than the competition and has no problem juicing even the toughest fruits and vegetables. Featuring both a cutting disc and a puree disc, the BJE820XL Breville Dual Disc Juicer is like having a commercial juicer right in your home kitchen. The cutting disc features both titanium reinforced cutting blades and a stainless steel mesh filter basket; this lets the juicer chop up even the hardest fruits and vegetables, including pineapples, carrots and celery. The stainless steel puree disc and soft fruit insert will ensure that even the softest of fruits and vegetables, such as bananas and pears, will provide the maximum yield of nutrients. The direct central feed system not only helps get the most out of whatever you put into the BJE820XL but it also helps reduce noise and vibrations. While many of these juicers go to great lengths to remove, or heavily reduce, the amount of pulp in your juice, pulp lovers will want to check out the Breville BJS600XL Juice Fountain Crush. This slow juicer features a 240-watt motor that is designed to slowly crush up your fruits and vegetables, creating a thicker juice with the pulpy goodness that you crave. Not only can this juicer handle common fruits and vegetables like berries and carrots but it can also blend up wheatgrass as well. Keep in mind that unlike other juicers, the BJS600XL does require you to prep your fruit and vegetables before adding them. While you’ll need to spend more time with this juicer compared to other Breville juicers, you’ll save time when it comes to cleaning. You can place the majority of this juicer in the dishwasher and the included brush helps you clean hard-to-reach spots in the filter. 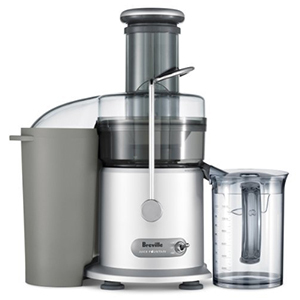 The Breville 800JEXL Juice Fountain Elite is one of the most powerful juicers that Breville offers. This incredible juicer uses a 1000-watt motor to deliver speeds of up to 13,000 RPM. As a result, Breville claims this juicer can harness up to 30 percent more juice out of any fruit or vegetable. In fact, the 800JEXL is so powerful that you don’t even need to take the tough rind off a pineapple before you juice it. If that wasn’t enough, the extra-large feeding tube means that you can spend less time prepping and more time enjoying your delicious juice. 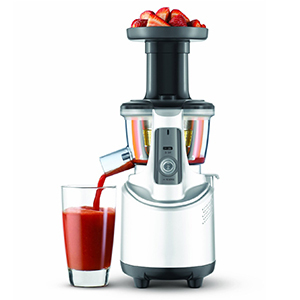 Haters of pulp will love the 40,000 filtering pores this juicer has, guaranteeing your juice is smooth and pulp-free.